By winning the BNP Paribas Open, his third title of the season, Federer is now searching for his third career back to back Miami- Indian Wells trophy. 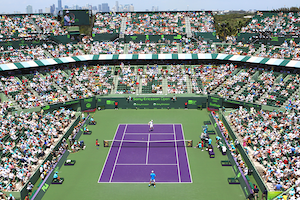 Amazingly, Federer has not been to the final in South Florida since 2006. In all likelihood, if the Swiss plans on being a finalist, he will have to battle past Djokovic in the semifinals. Even before that, Federer could be troubled by 2010 champion Andy Roddick in the third round and Mardy Fish in the quarterfinals who will try to best his 2011semifinal result. In the bottom half of the draw, 2009 champion Andy Murray and three time runner-up Nadal are on a collision for the semifinals. With 2012 BNP Paribas Open finalist John Isner or Jo-Wilfried Tsonga possible quarterfinal rivals, Nadal will have to be steady if he intends to keep his date with Murray. For his part, Murray may have to maneuver around the hugely talented Canadian Milos Raonic in the third round; this would be their initial meeting. Then, the quarterfinals could offer the dangerous Tomas Berdych as Murray’s opponent. At this juncture last year, Djokovic was undefeated and had claimed three titles. By prevailing at this year’s Australian Open in such dramatic fashion, Djokovic reminded all that he is fearless. On the other hand, Djokovic’s two losses in 2012 signal to the rest of the field that he is ultimately human. Consequently, although slightly, the door is now ajar for either Nadal, Federer, Murray or Del Potro to come through in Miami. Main draw play begins on Wednesday.